Here's a new approach. Instead of looking to Scotland or even typically picturesque US locations for my inspiration I'm going to explore much closer to home, well, just down the street really. I'm typically hard pressed to come up with reasons for what I do. I'm not on a search for meaning or beauty, to me, this is not about explaining my emotions or making sense of the world around me. Quite simply, I enjoy how a subject is transformed when I paint it. Back to the point. I live in Opelika, Alabama. It's a small railroad town and the sister city to Auburn of Bo Jackson and football fame. It was once quite the little manufacturing city even gaining national recognition in the film Norma Rae and is one of the places Johnny Cash has been when he says "I've been everywhere man." Listen to the song it's in there. I believe I can find inspiration for an entire series of paintings within 5 miles of the city limits. My friend Tom words it quite well- "to find so much beauty, depth, and energy in the "ordinary" - those simple things we see around us every day." Thanks Tom. This is not a bet or a Julie and Julia moment, but more of a question that I'd like to answer for myself. Here's the first one. 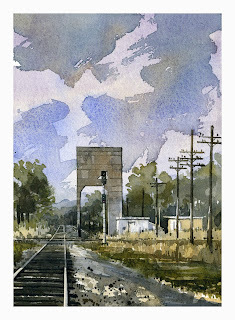 It's the old coaling tower just off of South Railroad Ave in downtown Opelika. We'll see where this leads. Wonderful perspective Iain, Opelika looks like a gorgeous place...I vaguely remember reading an old interview of Andrew Wyeth and the fellow asking the questions asked him why he never travels or visits any centers of art, and Wyeth's response was something to the effect that he could stand in one spot for the rest of his life and never fully explore those two square feet.